This hiatus is going to be brutal. Really really brutal. 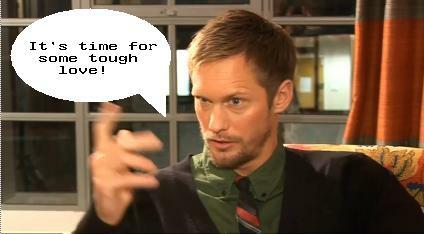 I just called Professor Northman and told him to prepare a room for me. Back to rehab I go. Like the new look, Prof. So in the wake of the latest Skarsgård Syndrome attack they’ve stepped up my meds at the Northman Treatment Centre. I’m currently on a high dosage Wolf Blass Merlot, Shiraz and Pinot Grigio and Dos Lunas Tequila. Just look what I have to deal with. 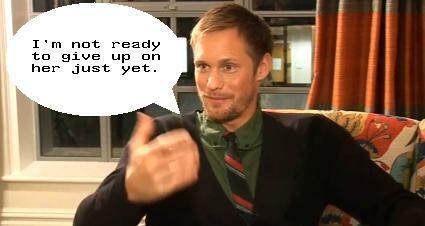 Check out the rest of the Details photo-shoot and the interview at SkarsgårdNews.com, that’s if you can handle it. 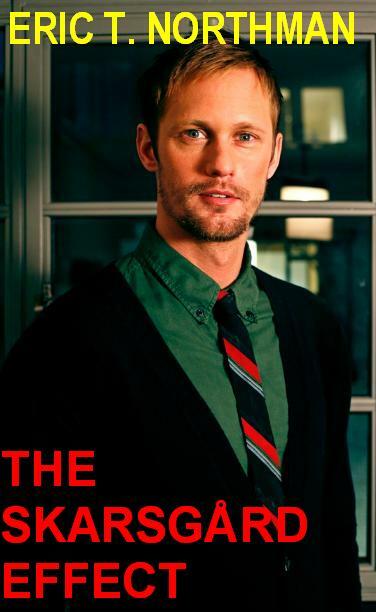 The Skarsgard Effect is available anywhere fake books are sold. It’s a good thing you can get service in the isolation rooms at the Northman Treatment Centre and that the orderlies don’t know how to properly put on a straight-jacket. I managed to sneak my cellphone in it without them knowing. Prof. Northman will never find out … unless he reads this blog. Mwahahahaha! So last night I had a particularly bad episode of Skarsgard Syndrome, which involved screaming “OMG!” for 40 minutes, followed by the word “Wow” on loop for 3 hours. It all started with this. Thanks, SN.com. SN.com is my Hot Alex Crack dealer, and the main reason my recovery has been so slow. 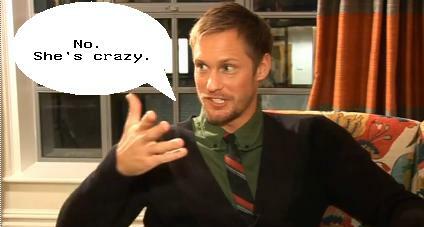 After my outburst, I merely suggested that the best possible treatment would be for me to actually meet Mr. Skarsgard. The response was decidedly negative. Please?! Pretty please? With strawberry ice cream and a burrito on top? Anyway, after my episode, Prof. Northman thought I needed to spend sometime alone reflecting on my behaviour and how it is holding me back. "You seem to be getting worse and not better." I’m not crazy, I’m just a little unwell. "This entire blog is pretty damning evidence." 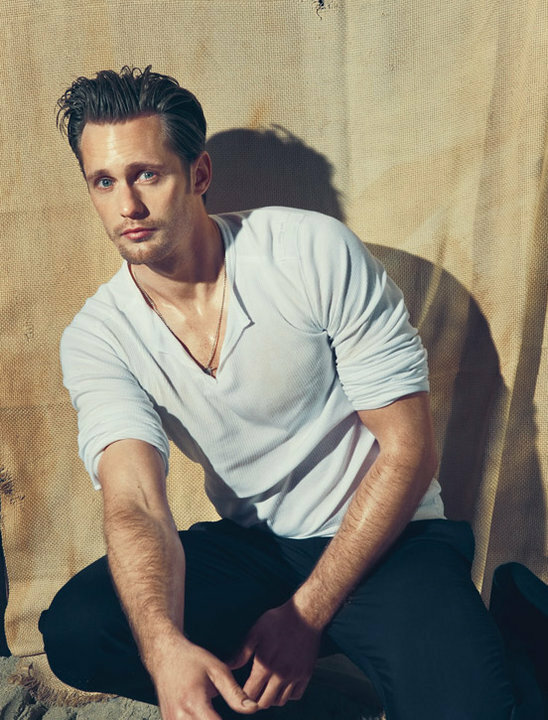 Unfortunately, my employee health insurance does not cover Skarsgard Syndrome or True Blood withdrawal, so all the expenses I have incurred while at the Northman Treatment Centre (NTC) are out-of-pocket expenses. Well, I guess that’s what credit cards and the Bank of Mom are for. The past few weeks, my treatment has focused primarily on deflection or distraction. 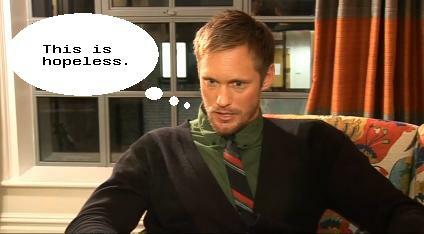 Prof. Northman thinks that if I were to (get a life and) focus on other interests, I might be able to survive this freakin’ hiatus. So I’ve been doing that by re-watching Band of Brothers – a former obsession of mine. I’ve also been watching trailers and reading everything I can about The Pacific, which premiers next month on HBO. It’s been pretty effin’ ninja reliving my excitement over the men of Easy company. 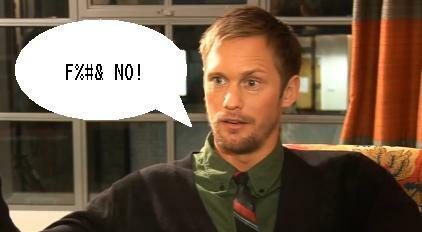 I think I’ve been making great strides over the past week, but Alexander Skarsgard really doesn’t want me to get better. He certainly didn’t help my cause by showing up at the premiere of The Pacific. "There is always going to be temptation!" I consider his appearance nothing less than sabotage! Did I mention that I suffer from paranoia? Next week promises to be pretty intense, with a busload of new patients arriving at the NTC. Right now, the group therapy sessions are pretty crowded. Still, there’s no better place to go for treatment. "There is only treatment. There is no cure."